Jake joined the company in 2017 as an apprentice and is currently studying level 2 trees and timber at Easton College, Norfolk. Owen joined the company in January 2013 as a qualified and experienced arborist and landscaper. 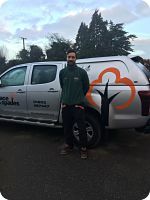 Brendan joined the company in 2016 and is qualified in Countryside Management and Environmental Conservation and level 3 Arboriculture. Joshua joined the company in 2014 as an apprentice and is currently employed as a full time Tree Surgeon.